More than 260 alleged victims of a baby-trafficking network in Spain begun under the dictator General Francisco Franco have started legal action demanding an investigation. A victim-support group, called Anadir, estimates that thousands of babies were stolen over decades. Many were taken away from parents with left-wing sympathies and given to other families. 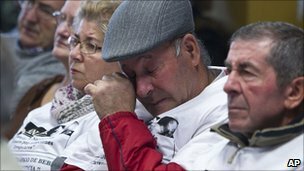 But the group says some babies were stolen after Franco's death in 1975. Enrique Vila, lawyer for the victims' group bringing the case, describes a mafia of doctors and intermediaries he claims was trading children for cash. The practice of forcibly removing children from their mothers began in the immediate aftermath of the Civil War. The victims then were largely Republican supporters - including prisoners - whose children were handed to more "ideologically suitable" families. "This structure, these methods allowed people to see the potential for a business," said Mr Vila. "It all started for political reasons, but in the end it could be any child at all that was targeted." Anadir was founded by Antonio Barroso, after the man he always believed was his father made a death-bed confession. He admitted he had bought his son, paying "more than the price of a flat" to doctors, in cash. DNA tests later proved that Antonio and his parents were not biologically related. "We want the prosecutor to open a national investigation," Mr Barroso said outside the general prosecutor's office. He was accompanied by a crowd of Anadir members in white T-shirts declaring themselves "the victims of baby-trafficking" and demanding justice. "There are cases of mothers who had their babies' graves opened and found them empty when they had been taking flowers there for 30 years. Mothers who were deliberately tricked. Then there are people like me, whose birth certificates were faked," Mr Barroso said. He tried to get a local court to look into his case, but failed. He then founded Anadir as a campaign group and has been amazed at the scale of the response. 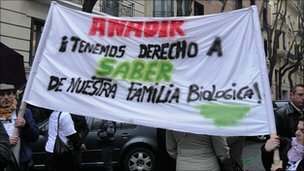 An Anadir banner declares: "We have the right to know our biological family"
Alberto and his mother Solidad Hernandez are both members. Solidad gave birth to twins in the 1980s and was told one had died. But as many mothers now recount, she never saw the body. Alberto says the official paperwork does not match up. "One set of papers says my brother was buried, others say he was cremated. One says he died of respiratory problems, another that he was malnourished," Alberto says. The inconsistencies feed his suspicions and give him hope his twin is still alive. "All my life I've thought there was someone out there. People always see me in places I have not been. This case could bring all that to a close," he says. Lawyer Enrique Vila admits that not all the suspicious deaths are clear-cut thefts. "Some mothers may be clinging to that chance, as a means of hope," he says. "We don't know, we have to investigate. We need to check all the records, and if necessary order exhumations, to see if there is an empty grave." But he claims a funeral parlour worker recently admitted transporting 20 empty coffins in the past. "That is just one man," Mr Vila says. "Just imagine how many there could be in the whole of Spain. This has to be a gigantic investigation."